A Bain-Marie is a Must Have for Delicate Foods! The Mauviel Bain-Marie is the perfect pan for cooking delicate foods like custards cheesecakes, and terrines. It creates a gently and uniform heat around foods. 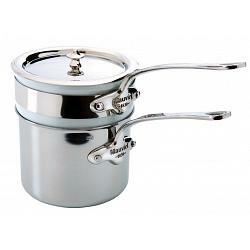 This bain-marie pot offers you the highest culinary technology, ensuring the best cooking results. The Mauviel bain-marie features a 5 layer multi-ply 18/10 stainless steel construction. Thanks to the non-drip rim, mess free cooking is guaranteed. The bain-marie features a polished outside finish that is sure to stand out in your kitchen. It has stainless steel handles, securely attached with stainless steel rivets. The bain-marie has a capacity 0.8L / 0.9qt and a diameter of 12cm / 4.75 inches. 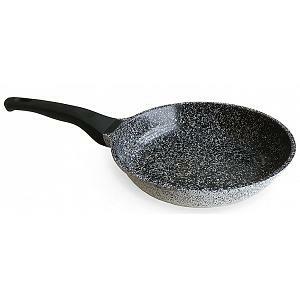 It can be used on gas, electric, halogen, and induction stoves. It's dishwasher safe for super easy cleaning and goes in the oven too. It includes a white ceramic insert. The Mauviel bain-marie has a lifetime warranty and was proudly made in France.